What are the odds of getting even? Danny Ocean and the gang would have only one reason to pull off their most ambitious and riskiest casino heist — to defend one of their own. But they’re going to need more than luck on their side to break The Bank. Ruthless casino owner Willy Bank never imagined that the odds were against him when he double-crossed Danny Ocean’s friend and mentor Reuben Tishkoff. I have to say I really enjoyed Ocean’s Eleven (7.5), it was a great and very original movie in terms of a criminal romp/heist kind of flick. Hadn’t see as anything as smooth as that since the old gangster flicks. Plus the chemistry between Clooney and Pitt just worked really well. Suffice to say I was disappointed and very underwhelmed by Ocean’s Twelve (6.0). I’d heard a number of people say Ocean’s Thirteen wasn’t that great…and strangely I hadn’t checked the IMDB score – if I had I would have seen it’s got a very good 7.1! Similar to the rating of the first. I decided to watch it anyway, and I’m thankful I did. It was surprisingly good – noticeably better than the middle movie. If you liked the first one, you’d definitely like this one. Good acting, good plays, some funny gags, slick cons and interesting action all around. The main trio were fantastic again (Clooney, Pitt and Damon) with the side characters being as charistmatic and goofy as ever. Matt Damon shows the depth of his acting, the way he plays Bourne then this character are oceans apart (pardon the pun). It’s a very entertaining movie, if you haven’t caught it yet – I suggest you do! Especially if you’re a fan of the first. I give it a solid 8/10. Movie Review – Syriana – Yawn! Movie Review – Inglourious Basterds – Coolbeans! hmmmm…. I’m a big fan of Ocean series. Surprisingly, I loved the 2nd one because it reminded me of some 60’s movies I watched as a kid. Besides that, the plot twists were fun too. As for the 13, quite okie but I was excited to see them head back to Vegas for a job. Loved Al Pacino in this flick. ya…i simply loved the part where Matt Damon seduced the PA with his fake nose up at the attic….until now im still unsure what significance is the nose of…perhaps a compensation for the phallic state of mind? The thing I didn’t like about the second [Oceans 12] was Julia Roberts role. It seemed a bit contrived to fit her into the movie to give her something to do. Other than that, I didn’t mind the second so much. I can’t remember the original Frank Sinatra / Rat Pack version of Oceans 11 [because I think when I watched it as a kid it didn’t keep my interest]. But, these Ocean movies are nice and slick. I have to agree with what you said about Matt Damon. I had the exact same thought. I truly agree that Ocean 13 rocks socks!! 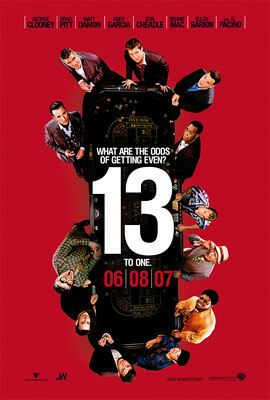 Ah Ocean’s 13, I watched this movie the first day it came out in the cinemas. It was quite nice though my personal all-time favourite would have to be the first one, Ocean’s Eleven. Ocean’s Twelve wasn’t as good and it seemed far from the first one. Being a huge Godfather fan, I thought the best part of this movie were the Godfather references. And I managed to catch each and everyone of them at the first go. TBG: Haha yah that was classic, I dunno you know they say about guys with big noses right? Big….hankies! Wahaha. Dabido: Yah totally agree, it really grated on me too. Matt Damon is indeed the man, but then I knew that ever since I watched Good Will Hunting. moons: Yah first one definitely best, but this is better than the second. vincent: Yeah there was quite a few, Godfather geek eh.